^ a b c d e Hess, Alan (March 1986). 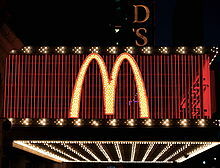 “The Origins of McDonald's Golden Arches”. Journal of the Society of Architectural Historians 45 (1): 60–67. doi:10.2307/990129. JSTOR 990129.